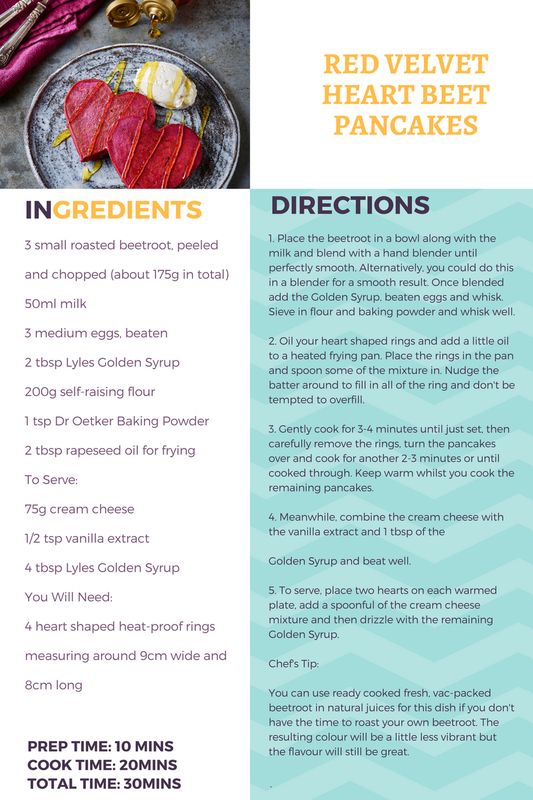 How To Make Red Velvet Heart Beet Pancakes. Red Velvet Heart Beet Pancakes anyone? 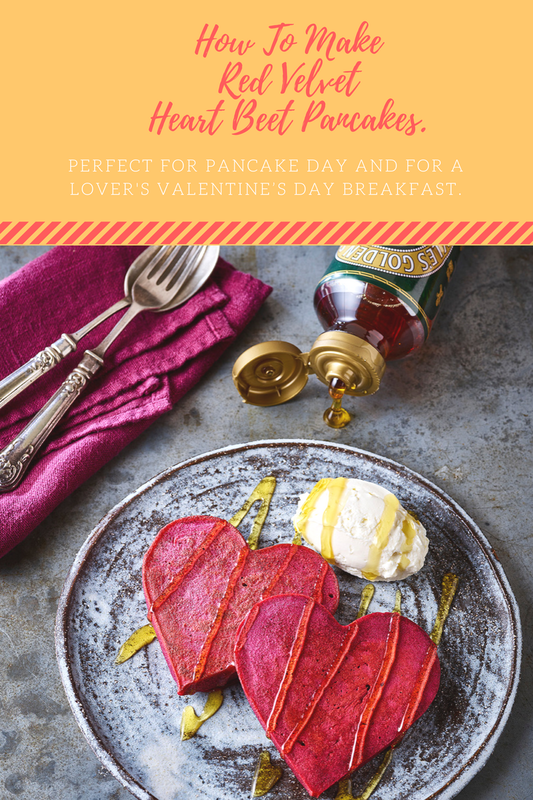 Perfect for Pancake Day and for a lover’s Valentine’s Day breakfast. Deliciously fluffy American style pancakes get the Red Velvet treatment with the addition of sweet cooked beetroot. Just perfect for sharing with that special someone. 1. Place the beetroot in a bowl along with the milk and blend with a hand blender until perfectly smooth. Alternatively, you could do this in a blender for a smooth result. Once blended add the Golden Syrup, beaten eggs and whisk. Sieve in flour and baking powder and whisk well. 2. Oil your heart shaped rings and add a little oil to a heated frying pan. Place the rings in the pan and spoon some of the mixture in. Nudge the batter around to fill in all of the ring and don’t be tempted to overfill. 3. Gently cook for 3-4 minutes until just set, then carefully remove the rings, turn the pancakes over and cook for another 2-3 minutes or until cooked through. Keep warm whilst you cook the remaining pancakes. Golden Syrup and beat well. 5. To serve, place two hearts on each warmed plate, add a spoonful of the cream cheese mixture and then drizzle with the remaining Golden Syrup. You can use ready cooked fresh, vac-packed beetroot in natural juices for this dish if you don’t have the time to roast your own beetroot. The resulting colour will be a little less vibrant but the flavour will still be great. 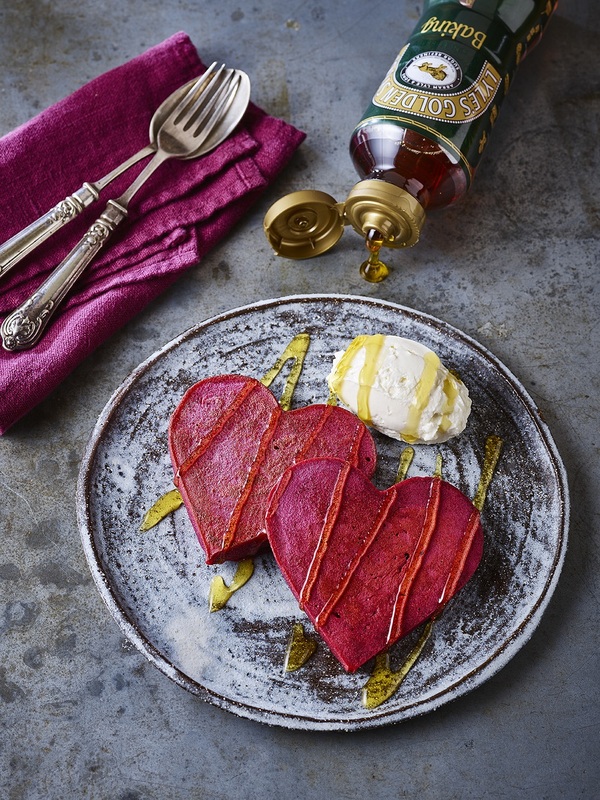 What do you think of these Red Velvet Heart Beet Pancakes? Fancy making some for your loved ones? Fancy making someone an edible bouquet of roses? Pancake Roses. Peanut Butter Pancakes With Salted Caramel Popcorn Sauce anyone!? Yes, indulgent! And yes, delicious!! 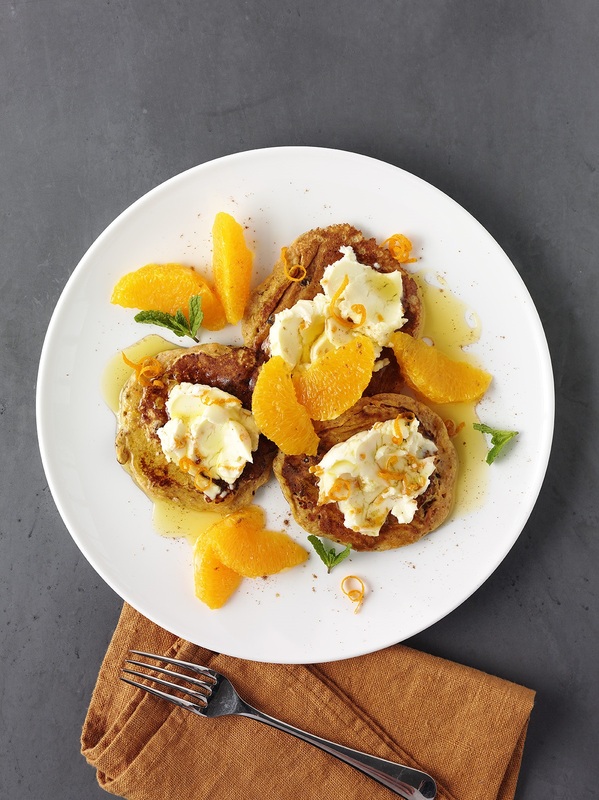 Enjoy the flavour of carrot cake – in a pancake! These are quick-to-make and a treat to eat. Carrot Cake Pancakes. Let us know what you think of these recipes in the comments below. Smoked Ham Tortilla With Chargrilled Peppers..
"Welcome To The Weekend: Link Up! #WeekendLinkUp"
"LIATORP Storage Combination With Doors"
Thanks for stopping by Heather. I love adding beets to my red velvet recipes – haven't thought of making pancakes! Will have to try around VDAY. Great pics, too #wordlesswednesday Katelynn. These look great. I would love to try. What a fun, healthier pancake recipe! I love the colour, the shape and the healthy ingredients! I'll be featuring this recipe at The Hearth and Soul Link Party this week. Thank you for sharing it, Claire!